Dr. Brent Born was born in Northwest Iowa. In 1988 he attended Buena Vista College in Storm Lake where he earned a degree in Biology while playing and coaching football. He then attended Iowa State University and in 1998 graduated with a DVM. He joined the Kenyon Veterinary Practice in May of 1998. Dr. Born is married to Tammy. They have 6 children in their blended family ranging from teenagers to our little 2 year old. Away from the clinic, Dr. Born enjoys being outdoors, golfing or hunting, and loves to watch his dog Mannie chase pheasants. Dr. Prestemon is a native of northeast Iowa and a graduate of Luther College, and the Iowa State University School of Veterinary Medicine. 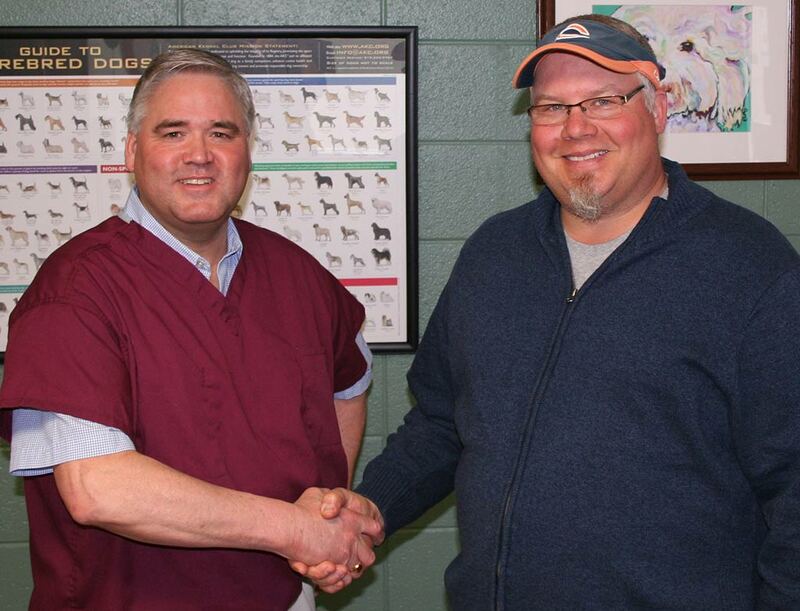 He has practiced in the area for 11 years and is excited to join the Kenyon Veterinary Clinic. He enjoys all phases of practice with a focus on skin and ears, allergy, and dentistry. He looks forward to meeting new and old clients at KVC. Dr. Prestemon lives in Northfield with his wife Kari and four children (Luther, Lars, Lilly, and Leta), and a playful adopted Springer Spaniel named Hailey. He loves fishing and boating in the summertime and his involvement in the sport of basketball in the winter. A Faribault, Minnesota native, Sara started as a full time Veterinary Technician with our clinic in December 2008. She graduated from the Minnesota School of Business-Shakopee Campus, with an Associate’s Degree in Veterinary Technology in 2005 and prior to working with KVC was employed as a Vet Tech in Faribault. Her long-term goals are to open a No-Kill animal sanctuary and to return to college to pursue a Veterinary licence. She has an intense passion for animals and has many pets of her own; Riley (Weimaraner), Zeke (Weimaraner-Lab Mix), Reagan & Paisley (Boxers), and the domestic short-haired cats: Small Fry, Purr-easy, Marma and Kitty Kringle. Deborah joined KVC in August of 2012. A Minnesota native, she attended Concordia College in St. Paul where she earned a Business Degree with a major in Organizational Management and Communications. She brings over 20 years of finance and management experience to KVC. Deb is married to Loren and they have two children, Britney and Zachary. Deb has two mixed-breed dogs, Maximus and Ellee Roo.